Koinobiri flags are one of the great expressions of Japan. However, the opportunities for children to see the grand carp flags swimming in the background have gradually decreased. 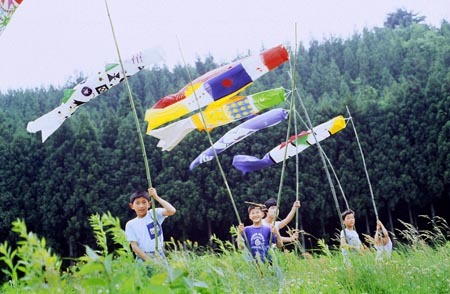 The picture shows children marching in a green rice field flying carp flags that were made at my studio. When carp flags are filled with wind, they swim in the sky and appear as though they are on the surface a rice field lake. I hope children can keep these experiences and grow with the feeling that we are living with mother nature.